In my lead-up to NXNE, I spent a lot of time playing with their Schedulizer, listening to artist samples and marking down everything that grabbed my attention in hopes of juggling as many performances as possible into my itinerary. One of the artists that immediately caught my attention was Montreal’s Nash. His indie pop-rock(steady)-funk music (really – it goes to all of these places) immediately grabbed my attention not only for its easy to groove to melodies, but the emotional depth and maturity in the lyrics. 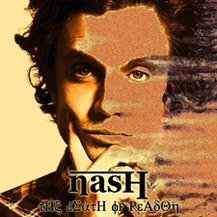 Energetic, persevering and ambitious – Nash sang, played bass, guitar, keyboards, programming, omnichord and glockenspiel on The Death Of Reason – his live show reflects his spirit. As I described it, Nash is “auditory sun, sand and liquor” and really, what more could you ask for in the midst of summer? And yet, Nash’s music is more than a fun summer playlist. The stories he spins with his lyrics reflect the common themes of human experience, adding perhaps the reflective autumn harvest of lessons learned the hard way – unsurprising, given the chaotic and often painful life he’s lived. On that note, come take a walk through a musical memory lane called The Death Of Reason. Walk Alone: Kicking off this album is a grooving, funked-out number that encourages optimism and dancing, all while acknowledging the pain that can build within us until it breaks loose. An anthem for those with troubled pasts seeking to purge and rise above, “Walk Alone” brings playful riffs and hip-shaking percussion. Evokes memories of Edwin’s solo album Another Spin Around The Sun (a great album, but I digress). Awesome vocal layers carry the song through its outro. Taken Away: Given Nash’s confessed vagabond history, one senses that this tale of a troubled man with dreams on the run from his pain is a particularly personal tune. Again, Nash’s sound is strangely upbeat, even as he sings of “when everything is taken away“. It’s a very difficult matter to balance an upbeat rock melody against lyrics that, were you to read them without context, evoke a melancholy ballad. Luckily for Nash, he succeeds. The encouragement to not look back spins enough positivity into the song to make it fitting to rock out and perhaps celebrate endings as beginnings. Kind of like an Irish wake to misery. Suit Up: A little more electro-pop than rock compared to the opening tracks, “Suit Up” still delivers riffs, but more as punctuation, mixed a little further behind the vocals. Lyrically, you could consider this a happier version of Muse’s “Uprising”, one that focuses more on the little things and choices we can make. “Feed your mind, but careful what you sow,” Nash warns. Broken Down Satellites: Hands down, this is my favourite on the album. I’m pretty sure this is the song where I made tracks to the merch booth to acquire the CD. Heavy funk-rock feel to this one with almost robotic filters on the vocals at times. A biting, sardonic look at society and those in power versus those who will not – or cannot – seize it back. “Sugarcane rum in the Malibu sun/Where the land sharks swim in their boats to have fun” is such a fabulous lyric, and only a taste of the clever metaphors and rhymes Nash offers up on this one. Sad Robot Harmonies: Fittingly, this song’s pretty heavy on programming. I can’t possibly explain this one better than Nash himself, so allow me to quote from his bio: “The song is a large thank you to some really good people in my life which points out the contrasts between good-intentioned people and people with agendas, and my inability to deal with or be able to cope with the latter. I figured I’d be ironic about it and tell it from the perspective of a robot with artificial intelligence who’s so frustrated with humans and the terrible things that they do that he decides he can’t take it anymore and resorts to building himself a tree house so that he can be removed from his human counterparts.” Yeah, Nash is awesome. Not since Ben Folds has a song about being up in a tree sounded so great. Super Symmetric: Lower octaves seep into the composition on this number, a condemnation of conformity and the futility of running from oneself. As with the preceding song, Nash examines the important of connection as opposed to isolation. Towards the end, the song almost seems to expand into the auditory space, diverging from a narrow delivery to something more sprawling. Tasty. These Days: Contemplative and delicate, with a music box quality to the keys employed, “These Days” is the inevitable ‘stage self versus life beyond the performer’ number that almost every artist will write at some point. I’m often ambivalent about such songs because many come off hokey or disingenuous. While Nash comes off as sincere – and perhaps referring also to playing a part on stage in the metaphorical sense – it’s not quite as solid of a track as the rest of the album thus far. In A State Of Mind: The tempo picks back up for this tune, one that captures the entire vibe of the album: namely, that no matter how bad things get, we can survive and even thrive. The funk-acoustic is hard at work in a song that inspires. “Break from all your chains/Gotta believe in something strange/Make your own mistakes/And carry on.” By the end, one begins to feel like a personal team of Nash cheerleaders is right behind you. Armageddon Dance: I feel like this rocking number (which has the sass I love on “Broken Down Satellites”) is a more sardonic answer to Britney Spears’ “‘Til The World Ends”. If you find yourself in Los Angeles on the last night of the world – or perhaps just a night that feels that way, this song should be blasting from your car/computer/stereo. “The people shout out, there’s no room for pity/And the rich die young from lookin’ so pretty… Let’s get lost in the beats of the underground.” Love it. Good To Go: Between the vocal filters and the dark melody opening this one, “Good To Go” is a sinister tune – a strange fit on an album brimming with positivity. That said, we’re dealing with a song about leaving a bad situation/person, so it’s a wise stylistic choice and feeds on the aggression of “Armageddon Dance”. There She Goes: Welcome to the church of Nash, ladies and gentlemen! Think organs and almost military band drumming and your preacher, a disillusioned soul condemning a false martyr. In this case, one assumes he’s talking about a drug dealer, leaving bodies in her wake of doled out pills. The detachment of the supplier from the consequences of meeting demand is woven cryptically into this one. Friendz R Drugs: We all have stories of teenage hijinks and perhaps broken rules as adults. Sneaking into bars on a fake ID; partying underage; walking all across your city for one long, crazy night, taking in the characters out at 2am (that latter one is one of my weirdest amusing stories of my high school years). Nash reflects on these times, noting that ultimately, no matter what you choose to do, friends are crucial and not to be undervalued. After all, they’re the ones who’ll still be around when the ceiling stops spinning or you’re no longer belting “Barbie Girl” on a public bus on New Year’s Eve. A lilting, mellow number that neatly wraps up the album on a fuzzy nostalgic note. Final Comments: For a Montreal man, the flavour of Nash’s sound is distinctly California pop-rock beneath the surface of the programming. Fans of Jack’s Mannequin, Modest Mouse or Jimmy Eat World (“The Middle”) will probably feel at home right away, given the contemplative yet punchy-playful lyrics on the album. While dealing with darker themes and sadness, this album is anything but depressing. It’s not the go-to for a night meant for wallowing; it’s the album you spin the next morning as you pick yourself back up and keep moving. Many of the songs here work well as party music, but are more befitting a backyard barbeque with good friends and great wine/beer. Aside from a little repetition in the lyrical content/messages, this is an incredibly solid album. Need a road trip album? This works! Need an album to get you through your commute? Nash has you covered. Need an album for working out, even? This one’s waiting with its uptempo grooves to get you moving/jogging/whatever you like. It’s a strength that the album can plunge into the icier depths of our collective experiences and remain so positive and hopeful. A fantastic first album.